Please be aware the server software from the developer is in alpha/beta, so you can expect some bugs to occur!! If you do find any issues please send in a support ticket with information, or contact the developers on the Ylands forums. What are Ylands Game Servers? Ylands is a quite unique sandbox adventure game, that lets you can explore your creativity. There is a platform for making custom games too, ranging from simple scenarios to sophisticated game modes! 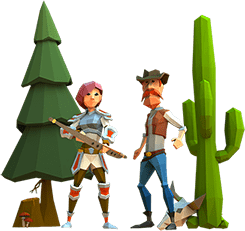 Explore the fantastic looking open-polyworld of Ylands along with friends on your very own Ylands game server with us. You can gather resources, build ships and sail to other Ylands, descend to dark depths or climb the tallest mountains, craft hundreds of items and objects and build fantastic structures! Explore uncharted Ylands, laying siege to castles, engaging in naval battles, taking part in car and horse races, building elaborate energy devices or coming across quirky things like crab armours, mutated penguins and much more! With Ylands you can live out your childhood fantasies and truly create your own adventures. You can fully control your very own experience with our fantastic control panel, giving you access to all the game servers settings via easy to use configuration editors, protect your Ylands by using our backup and restore features and even create new Ylands at the click of a button!